Beneficiaries: 12 schools and 13 villages (Tawal, Tawal Besi, Duchene, Ladap, Kichet, Richet, Tajumrang, Ri, Gumba, Choke, Kutal, Salleri and Syaktali) in the Ri VDC. Apart from the invitations sent out to the 12 schools a community service announcement on the Dhading FM radio station attracted others from other VDCs, some of who walked over 6 hours to get to the camps. Objective: To assess a person’s hearing, clean out wax treat infections and provide hearing aids where needed. Details: NAFA supported NAHOH by providing Keshab and an assistant from Kopan free transport, accommodation and meals for the 8 day camp (including 2.5 travel days). Outcomes: Nearly 1,100 people registered and seen by Keshab. Many foreign bodies in ears found, including cockroaches, other insects, feathers, seeds and straw. 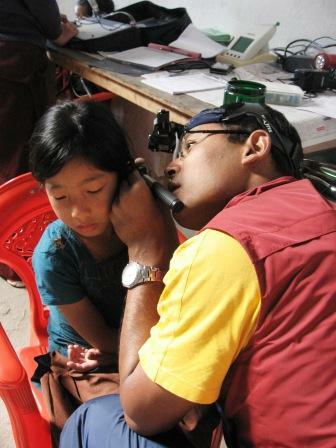 Many ear infections and perforated ear drums.2 who attended ear camp subsequently had follow-up treatment in Kathmandu in February 2012, one requiring surgery and the other treated with medicine. 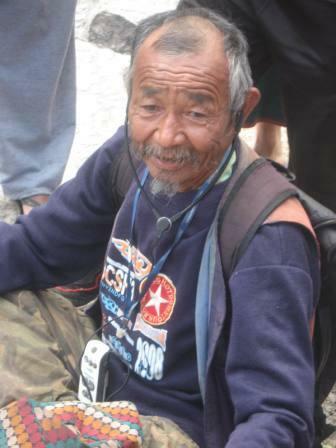 One older gentleman from over 6 hours walk away ended up serenading everyone as appreciation for receiving a hearing aid from the HearingNepal Program in lieu of the $3 – $15 that is usually asked as a contribution towards the cost of the aid.